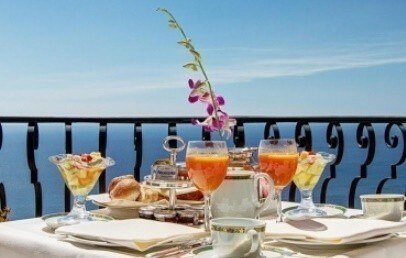 The luxurious 5 stars San Domenico Palace Hotel, set in a beautiful flower garden, is located in the charming historic centre of Taormina, picturesquely perched on the sea. 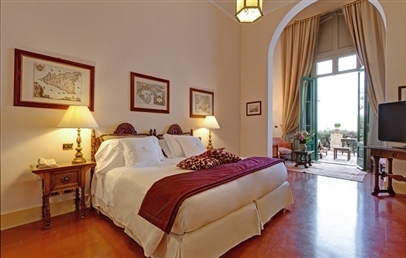 San Domenico Palace Hotel has been obtained in 1896 by a convent of 1430, of which preserves the original structure. 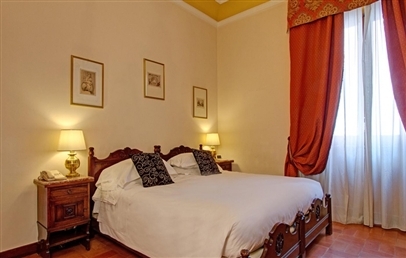 Inside you can still feel the ancient monastic atmosphere, including the cloisters, images of saints, the choir stalls, the sacristy and the rooms once quiet cloistered cells, all in strong and seductive contrast with the luxury hotel comforts and services. Many prominent figures of the politics, show-biz, culture and science have been fascinated by the magic of San Domenico Palace Hotel and have left a sign of their passage in the precious gold-decorated parchment book, jealously hedged in by the owners. The book begins with a picture of the Kaiser; in the book you can find, among others, the testimony of King Edward of England, Guglielmo Marconi, Luigi Pirandello, Thomas Mann, Richard Strauss, Marlene Dietrich, Ingrid Bergman, Audrey Hepburn and Michelangelo Antonioni. San Domenico Palace Hotel has 105 rooms, including 15 suites, spread over two wings of the building: the first one is the oldest and contains the “Ancient Convent Rooms” which were once monks' cells, small but charming; the second annex, called “Grand Hotel” (dating back to 800) contains the large, sunny rooms and suites, decorated with warm colours and typical materials of this sunny land. 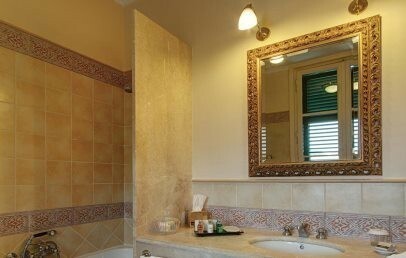 All rooms are equipped with air conditioning, colour satellite TV, mini bar, Wi-Fi connection. Among the suites, particularly worthy of note is undoubtedly the Truman suite, furnished with brass beds and Chinese lacquer, for an even more exclusive stay. 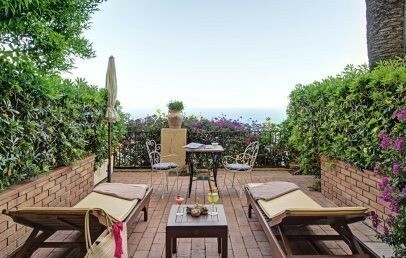 The summer begins, San Domenico Palace Hotel Taormina launches its first-ever Beach Club the former Lido Stockholm – located in one of the most beautiful bays of Taormina “Baia delle Sirene”, only 10 minutes from the hotel and with complimentary shuttle service, leaving on regular basis, with scheduled times. The Club is for exclusive use of the hotel guests and a selected external clientele. Our Executive Chef Massimo Mantarro, leading the 2 starred Michelin Restaurant “Principe Cerami” has designed the menu of the Beach Club to ensure the greatest quality of our offering. The access to the beach club and beach service is included for guests staying in a Suite. Reserved rates for hotel guests (not staying in a Suite) are: Euro 40.00 per day/room (double occupancy), extra person Euro 15.00, Single room occupancy Euro 30.00 per day/room. The modern spa is the ideal choice for those who want to spend some time taking care of themselves and for those who wish to relax with massages and customized beauty treatments to regenerate body and mind. The main restaurant is "Les Bougainvillèes" where breakfast and dinner are served during the summer months and with good weather conditions with a variety of dishes, ranging from traditional to international cuisine. The Gourmet Restaurant with 2 Michelin Stars "Principe Cerami" offers a modern interpretation of the Sicilian and Mediterranean cuisine (not included in the half board treatment) with à la carte service. At the Principe Cerami only children from 6 to 8 years are welcome. At the restaurant "Blooming Perlè" by the pool are served several low calories specialties for those who search a tasty and healthy meal. Furthermore the "Antico Refettorio" is open from November to March, offering a mostly international cuisine but strongly related to the typical island products. Dinner is followed by piano bar entertainment at the lounge bar "Oratorio dei Frati" which also offers quick meals throughout the day. The ancient church of the convent has been renovated while keeping its original architecture, to host the Congress Centre, consisting of a big hall and other smaller rooms. The Centre can accommodate up to a maximum of 400 people and is equipped with the latest technologies; it sets itself as the ideal location for conferences, conventions and congresses in a charming and refined setting. 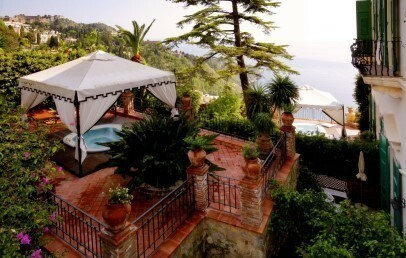 The beautiful outdoor pool is available to guests of San Domenico Palace Hotel. Free Wi-Fi in common areas; paid internet in room (except in the suites). 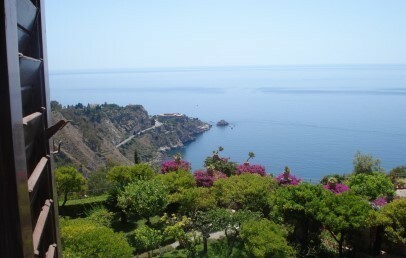 City tax – The municipality of Taormina requires the payment of a tourist tax of € 5,00 per person, per overnight and has to be paid cash on-site. The luminous and sunny rooms have been furnished in a way that reflects the history of the place, as well as its traditions, without compromising with regards to contemporary comforts. The bathroom has a tub and hair dryer. 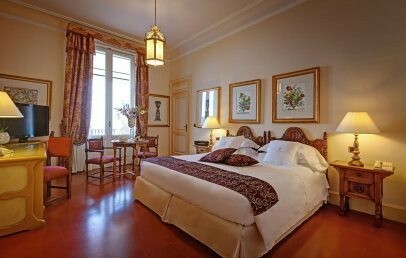 The Classic rooms have a beautiful view of the cloister or the city. 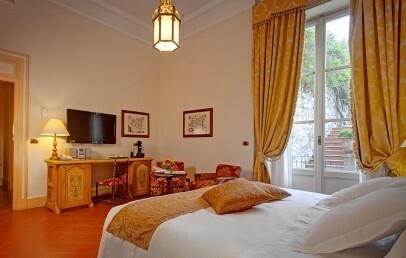 Superior rooms have been built in the wing of the old monastery. They reflect a welcoming and comfortable atmosphere and offer harmony and relaxation; elegance and simplicity. There is also rooms with access for guests with disabilities and it is further possible, upon request, to have a non-smoking room. The bathroom has a tub and a hair dryer. 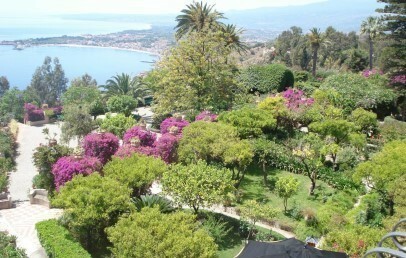 The rooms have a beautiful view from the window on the marvelous Mediterranean garden and on the bay of Taormina. 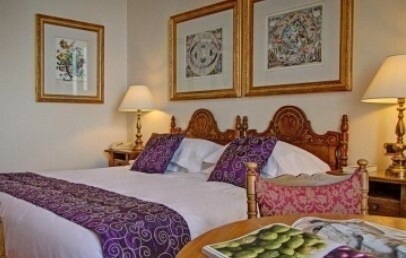 These rooms are located in the Grand Hotel wing and are all furnished elegantly, with warm colours and are ideal for a stay devoted to full relaxation. 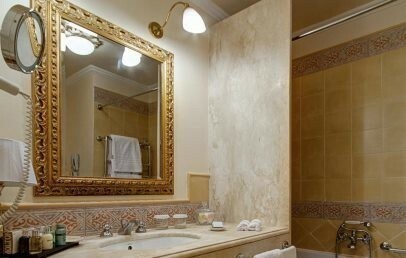 The rooms and the bathroom are spacious and have a tub and hair dryer. 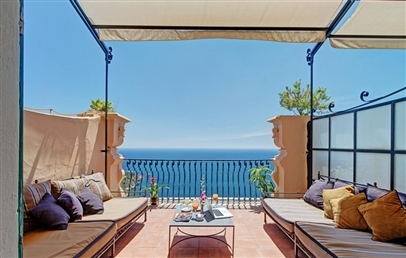 Some Deluxe rooms offer a private terrace, which is suitable for wonderful candle-light dinners; others have a charming balcony with a splendid view of the bay. 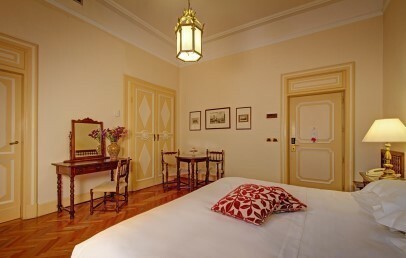 It is possible to request a Deluxe room with connecting door to a Grand Hotel Suite (upon availability). 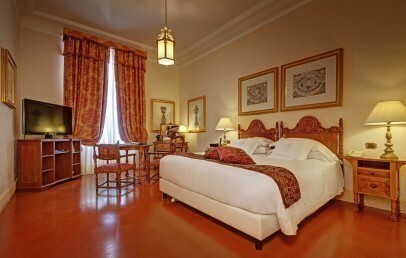 The elegant room is held in warm colours and is ideal for a stay devoted to full relaxation. The room and bathroom is spacious. The bath has a tub and hair dryer. 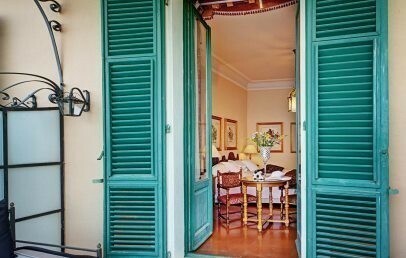 Executive rooms offer a private terrace, which is suitable for wonderful candle-light dinners, with a splendid view of the bay or the theatre. 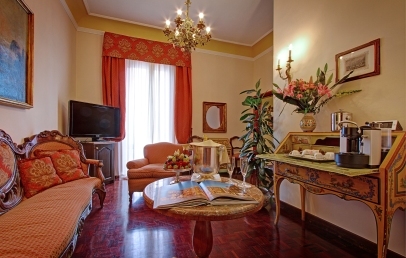 The luxurious Suite is held in warm colours, is elegant and welcoming. The Suite has a bedroom and a living area. The bathroom offers a tub and a hair dryer. Junior Suites further have a terrace or a balcony and a view of the bay. Rooms for peaople with a disability as well as non-smoking rooms available. 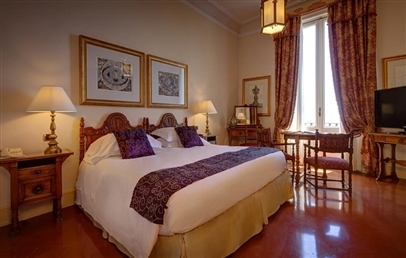 The room is located in the building of the Grand Hotel wing, in between of the beautiful Mediterranean garden with an exclusive whirlpool and a beautiful panorama view over the bay. 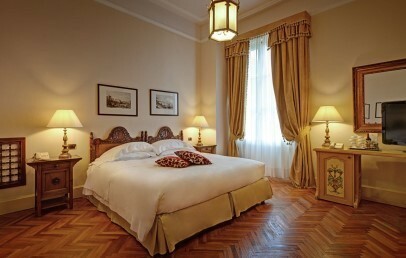 The room consists of a double bed and a small living area. The bathroom has a tub and hair dryer. 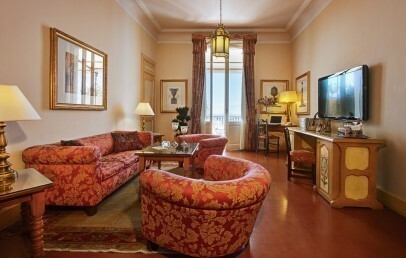 These suites are furnished in an elegant and antique way, all being absolutely unique. They consist of a bedroom with living room and a spacious bathroom with tub. 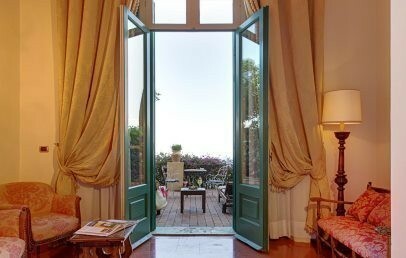 Possibility to request a Suite with a connecting door to a Superior room (upon availability). 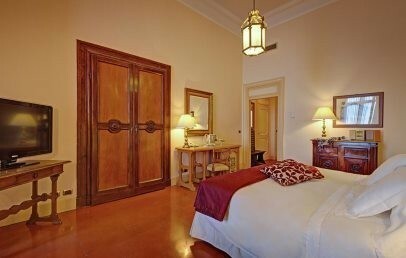 The elegant and spacious Suite is furnished in a simple but elegant style and has a living room and a separate bedroom. The spacious bathroom offers its guests a tub and hair dryer. 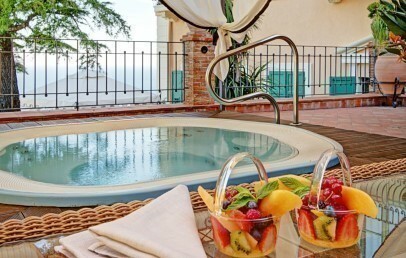 Grand Hotel Suites further have a terrace or a balcony with a view of the bay of Taormina and the gardens of Naxos. Possibility to request a Suite with a connecting door to a Deluxe room (upon availability).